At last year's THE Port hackathon, the Better Body Bags team emerged with a new approach to body-bag technology that catered to the needs of humanitarian organisations. What started as a weekend hack has developed into a full-scale R& D project, as the team joins forces with the International Committee of the Red Cross (ICRC) to put their body bags into production. Ricardo Páramo Peláez, the team's product designer, presented the first prototype at THE Port Hackathon 2014. The "body" is his fellow team mate, João Cordovil Bárcia. Brought together during THE Port hackathon, the Better Body Bags team has a diverse set of backgrounds, and includes CERN staff members, some former CERNois and innovation enthusiasts from external companies and organisations. During the hackathon, they were presented with the difficulties faced by humanitarian organisations like the ICRC and decided to tackle the “body bag problem” head on. The team first considered ways of thermally isolating bodies, and looked to the Mylar foils used by the ATLAS experiment. Inspired by the foil's ability to keep detector elements shielded, the team sought out similar, commercially available foil that could be used in the body bags. “The answer was found in the food packaging industry,” says Head. “A massive amount of research has gone into crisp-bag foils, which have been designed to keep smells and air inside without any leakage. And best of all, they are widely available and inexpensive.” Using these crisp-bag foils and other technology – such as humidity absorbers and vacuum packing – the team is developing prototype body bags that are airtight, don't leak and don't smell. As the body bags project continued to develop, the Better Body Bags team also had to evolve. They established a not-for-profit Swiss association, Social Solutions Research, which has allowed them to work with the ICRC's innovation team. 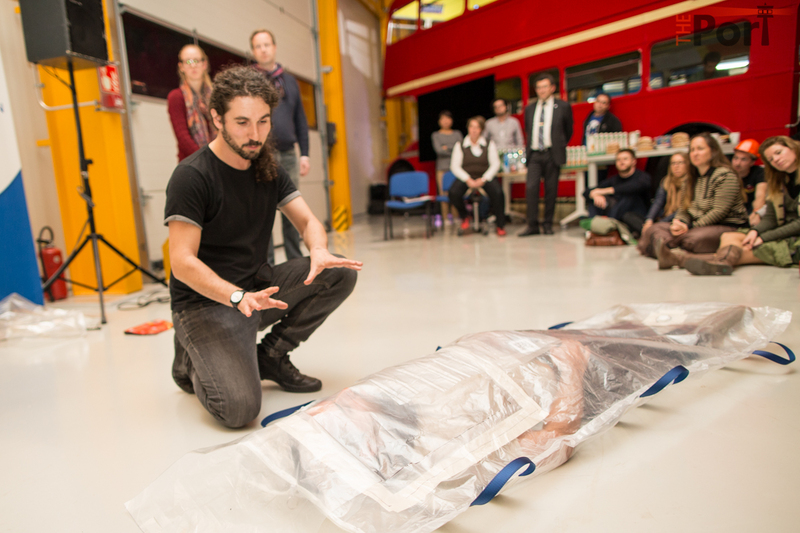 In May, they presented their body bag prototype to the ICRC Forensic Advisory Board, which provided enthusiastic feedback. The body bags were also featured at the recent United Nations Economic and Social Council (ECOSOC) meeting at the Palais des Nations. 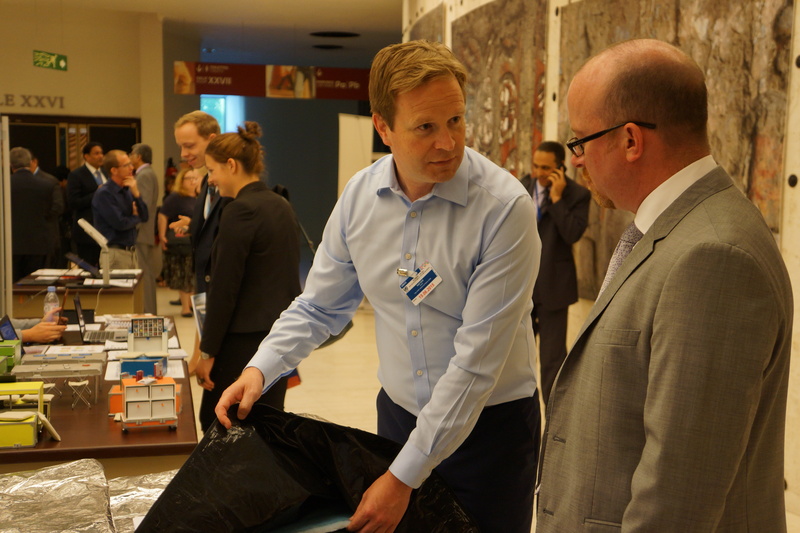 Better Body Bags team member, Steffen Raetzer (left), explains the bag's new features at the ECOSOC meeting at the Palais des Nations. Meet the Better Body Bags team! The Bulletin would like to invite you to meet the Better Body Bags team at Ideasquare on 24 July at 2 p.m. Please note that the visit is only open to CERN access-card holders and that registration is compulsory. an opportunity to discuss the bags and ask questions. The number of participants is limited to 20, so don't hesitate to sign up! Once the maximum number of participants has been exceeded you can still sign up and we will contact you if people drop out.